Bibimbap, The ultimate comfort food! Bibimbap (비빔밥) is probably one of the most well-known and beloved Korean dishes to many people. Even if people don’t know anything about Korea, it’s not too difficult to find people who had Bibimbap sometime in their lives. Bibimbap simply translates to “mixed rice with meat and assorted vegetables“. You can make endless variations to this dish depending on your preference and dietary requirements (e.g. microgreens bibimbap) and also based on the dish/bowl it is served in (e.g. dolsot bibimbap and yangpun bibimbap). More traditional and authentic versions of Bibimbap are made with raw beef and raw egg yolk along with other vegetables, but I prefer making mine with cooked ingredients. As I was growing up, my mom used make bibimbap to get rid of vegetable side dishes (banchan) that are getting a few days old (less fresh) or when she didn’t want to put much effort into a meal, she would just take out a few sautéed and seasoned vegetables and kimchi from the fridge, add a sprinkle of seasoned seaweed strips and made simple vegetarian bibimbap. So I don’t recall having much nicely presented Bibimbap, like the top picture above at home, yet regardless of the presentation her Bibimbap was always tasty! Anyway, how do you make your bibimbap? Any secret ingredients to share with us? Some cooking oil to cook the meat, mushroom, carrots and eggs – I used rice bran oil. 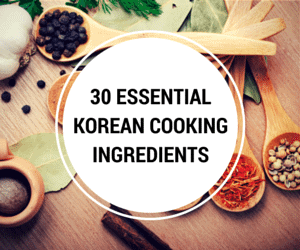 If you want to learn more about Korean cooking ingredients, check my 30 essential Korean cooking ingredients list! – Rinse, peel and julienne the carrots. Add some cooking oil and 1/4 tsp of fine sea salt in a wok and cook the carrots on medium high to high heat for 2 to 3 mins. 2. Put the rice into a bowl and add the meat, assorted vegetables, seasoned seaweed, Bibimbap sauce and the egg on top of the rice. Serve it. 3. Mix the ingredients well in the bowl and enjoy! How to make authentic Korean Bibimbap. It comes with to die for Bibimbap sauce! 350 g bean sprouts (mildly seasoned) 0.8 pounds, You don’t have to use them up if you think it’s too much but I love having lots of vegetables on my Bibimbap! Bibimbap sauce - The below sauce might be only enough for 3 servings if you like eating it spicy. 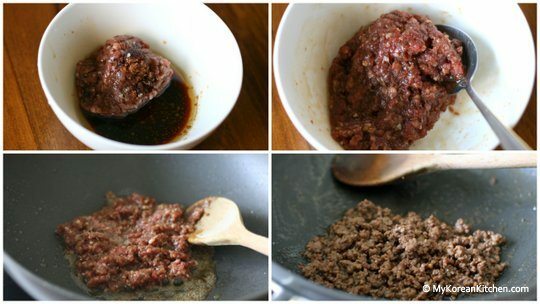 - For meat, mix the beef mince with the meat sauce listed above. Marinate the meat for about 30 mins while you are working on other ingredients to enhance the flavour. Add some cooking oil into a wok and cook the meat on medium high to high heat. It takes about 3 to 5 mins to thoroughly cook it. 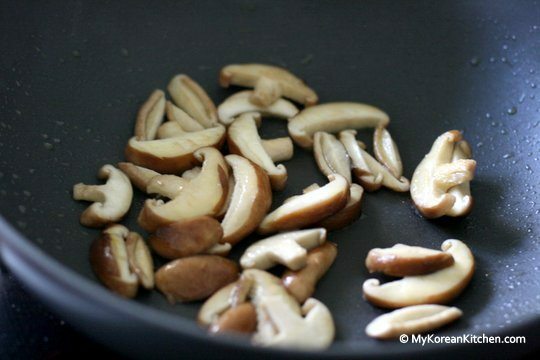 - Mix the Bibimbap sauce ingredients in a bowl. - Spinach and bean sprouts per linked recipe. - Rinse, peel and julienne the carrots. 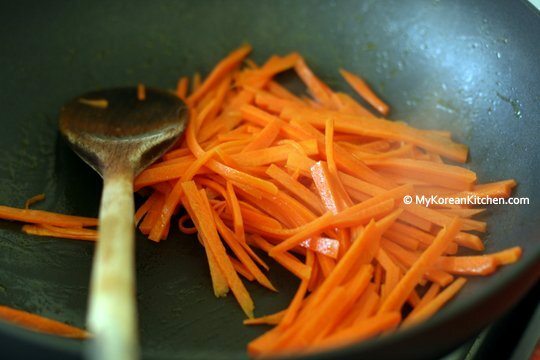 Add some cooking oil and 1/4 tsp of fine sea salt in a wok and cook the carrots on medium high to high heat for 2 to 3 mins. Every Bibimap Ive had in any Korean house or restaurant ALWAYS has the rice crispy fried at the bottom. Otherwise its just rice and veg/meat and not really bibimap. My son asked me to make bibimbap once (he used to work as a chef), and I had no idea what it was. I googled it and picked your recipe and have made it several times since and today I was reminded how delicious it is. We all love your recipe – thanks!! I have a post on Bibimbap; going to link to your recipe here. Thank you! Seasoned seaweed is only optional. 🙂 Also, you can make this soup with your dried seaweed. https://mykoreankitchen.com/brown-seaweed-soup-miyeok-guk/ FYI, they do last a long time. This was the first Korean meal I ever ate, on a KAL flight between Los Angeles and Seoul. I did not understand the cabin crew and had no idea what I had just agreed to eat. But if you are on a plane to Korea, it’s time to start eating Korean! Do the bean sprouts and spinach have to be warm for this dish? I just feel like (with how quick they go cold) they will go cold by the time the dish is prepared. Is it normal with this dish or should they be reheated? Yes, the spinach is cooked here. But you can use fresh spinach instead as well. Bean sprouts can be used warm or cold. It doesn’t really matter. Thanks so much for sharing this great recipe with us. My boyfriend and I truly became addicted and need to have this once a week now! I love your blog! Keep up with the good work. Wow – what a popular recipe! Will definitely try it – I think I need to look at your 30 ingredients list first! Now I’m worried my mom is gonna make it all the time, because it was really easy to make especially since we always have rice ready. I just made this tonight for the first time. It was my first time on your site. I didn’t think it was too time consuming. I cheated and doubled the sauce for the bean sprouts and spinach and used a rice cooker. We are military so my husband and our neighbor were both stationed in Korea and I visited twice. I brought a bowl next door as a taste test before my husband gets home and it was a hit! I’ll definitely be trying more of these recipes. Hopefully I can find one for yaki mandu! Thank you! Hi Michelle, Glad to hear you enjoyed my bibimbap recipe! I have a kimchi mandu recipe you can try if you like. https://mykoreankitchen.com/kimchi-mandu-kimchi-dumplings/ An instruction for pan frying method and steaming method are included in the recipe. Enjoy! This is one of my favorite Korean food! Loving your reciper of bibimbap. One of the nicest I’d tried. Thank you for posting! Very good recipe, especially the meat marinade and the spicy sauce. Will keep them in my recipe book forever. Thanks again, you are a wonderful cook! Thanks so much for this super yummy recipe! Just substituted some ingredients and left out the egg for a vegan bibimbap! Very good! But I find the sauce is waaaay too sweet. I would reduce to 1/2-1 tsp of sugar. Wow, what a wonderful and informative recipe. I especially enjoyed viewing the additional options, along with, the basic recipe. I opted to add fernbrake out of curiosity and availability. I also went light on the sugar across the board on this recipe because of my personal taste. Again wow!! Thank you for your informative blog. Thanks for the awesome and easy to understand recipe! I especially liked your sauce! I made a similar version and blogged about it! My husband and I both loved this! This was awesome!!!! Thank you so much! Does the spinach and bean sprouts need to be seasoned? Hi Jacey, you can use raw unseasoned spinach and bean sprouts if you like. But in this recipe they are both cooked & seasoned. Respective recipes are linked above but I will also link here as well. https://mykoreankitchen.com/simply-seasoned-korean-spinach-salad-sigeumchi-namul-version-1/ and https://mykoreankitchen.com/korean-style-seasoned-mung-bean-sprouts-salad-sukju-namul-muchim/ Hope this helps! Thank you for this recipe! I used to live near a Korean restaurant. Bibimbap was my favorite dish! Well I moved away and couldn’t find a place that made it in my new town. It took me way too long to realize I could make it myself. Your recipe is wonderful and very satisfying. I am so excited to try this recipe. What type of rice do you use? Short grain, sushi? Or does it not matter. Thanks! I’ve enjoyed making this recipe for a couple years. Thank you so much! Would it be ok for me to translate this recipe and publish it on my personal blog? Of course I’ll give you credit for the recipe and link to the original. Yes, that should be fine. Thanks. What do you mean in this part , I can’t understand these ingredient can explain it please ? Hi! I’m thinking of making this and keeping it in the fridge for the next few days. Should i keep the vegetables together or separately? Will water come out from the mushroom? I would keep the vegetables separately. Yes, the mushroom will release some water. Enjoy! I am so glad I came upon this recipe! Love to eat it for breakfast. I just eliminate the beef and use an extra egg. I use whatever is at hand, usually kale, broccoli slaw, onions, bean sprouts, mushrooms, kimchee, and minced habaneros or Thai peppers (I like it hot). Also substitute quinoa if I don’t have left over rice, since it’s quick to prepare and is a good source of protein. Thanks again for a great recipe…the sauce is awesome. Can’t wait to check out and try your other recipes. Hi Diana, Your breakfast sounds so good and healthy! Yes, I also do think the sauce is the key. The rest is use whatever you have in your pantry and fridge. 🙂 Glad to hear you enjoyed my recipe! Hello, I have long been a lover of Korean cuisine but am now recently undertaking to attempt to make things myself. I really look forward to making your recipe. My question is, what surface do you use to cook? I have a wok but I wondered if what I saw in the video recipe was one of the small portable gas burners that I have seen in stores and Korean TV shows. Or, please inform me if it is something else. I’m excited to try this. My husband hates spicy food — do you have a suggestion for a milder but flavorful sauce? I preferred the taste of this meal over bibimbap i’ve gotten at Korean restaurants around me. It’s a lot of work but so worth it. Thanks! Thanks, Carrie! You can reduce the types of vegetable ingredients that goes into to make it quicker. Nonetheless, glad to hear you enjoyed it!! I made this last night and it was amazing! I might not have to buy it anymore since finding this recipe, Thanks so much!! Hi Ami, I used short grain white rice (also known as sushi rice) for this recipe. Something like this one. Hope this helps! How spicy is this bibimbap sauce? I like some heat but not unbearable. i have been into Korean traditions since i always watch Korean dramas but I’ve always been really in love on the foods they eat! can’t wait to try this recipe someday,your bibimbap really looks delicious! Thanks, Jay. 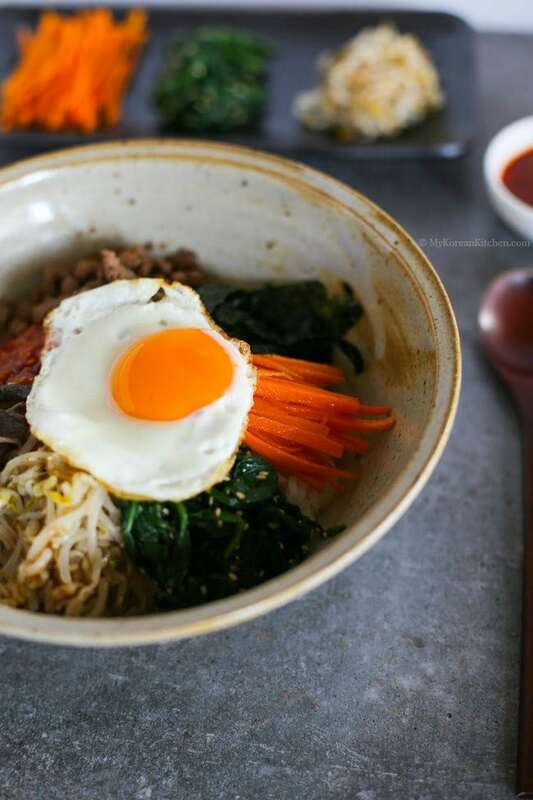 If you’re into Korean culture, you’ve got to try this bibimbap! 🙂 You will love it! I’ve made this dish like 3 times already and it’s been a hit with my family and my fiancée. I was a bit apprehensive to share it with him since I didn’t know if he was gonna like it but he loved it! Which I am super happy about since I’m starting to set a goal of learning as many Korean dishes as I can. I made some Bibimbap today and my mom had 2 servings, she loved it so much that she said that her taste buds waned more but her stomach was full already so she has admitted to have developed an addiction to this dish and so have I. Thank you for making it so easy to understand and prepare. hi i’m from Afghanistan. i saw bibimbap in korean films and liked it!! thank you for learning koreanfoods. this food is so yummy and delicious!! Hi Sue, I just came across your website when searching for a bibimbap recipe. I can’t wait to make yours but I have a question about an ingredient. When your recipe calls for sesame oil are you referring to the toasted sesame oil that is found in most Asian cooking? Thanks for sharing your recipes. Hi David, Yes it is. 🙂 Enjoy! The bibimbap sauce is delicious. Thank you for this recipe, Sue. I just made this for family for Super Bowl 2017. It’s a hit. Thank you for explaining in an earlier comment/response that the heated stone bowl creates crunchy rice. I’m going to figure out how to do that next time. You’re the best! Great to hear that, Kathy! Creating Bibimbap in a hot stone bowl is also in my recipe to share list this year. So stay tuned! I have now made this 4 times in less than 2 weeks because I LOVE it that much!! Each time I use what I have in the fridge and no matter how I change the ingredients, its heaven. First night I used a beautiful little steak sliced thinly. Next night, I had two turkey patties in the fridge and I cut broccoli into “matchsticks” instead of carrots. They were both wonderful meals. Third time it was back to thinly sliced beef. Tonight? Ground beef, some pre-packaged green salad with cauliflower from the deli and I got brave and opened up a can of black beans and added those to the skillet with the carrots. I cannot thank you enough for taking the time to share these recipes. That’s wonderful to hear, Tom! It’s a perfect meal for breakfast….. I love Korean dishes, and since Korean restaurants are too far from my area, I am able to make my korean dishes with the help of your recipe and satisfy my cravings. Thank you for this recipe! My new years resolution was to cook a recipe from every country in the world, and Bibimbap was the dish I chose for North Korea. This was super yummy, and made for amazing leftovers all week! I love the bibimbap sauce… I created your version and found I like it with less sesame. I also used rice wine vinegar instead of apple cider vinegar. I may never need to go to my favorite korean restaurant again now that I can make this sauce!! So Yummmmm! Thank you so much! I love the Bimibap dish and wonder when it is mentioned to cook the ingredients in a wok why is the special stone bowl required . I have always had this dish in the traditional bowl and thought it os cooked in the traditional stone bowl ;with or without the cover ;thats another question.can you please answer by e mail? This recipe doesn’t require a stone bowl. (Though you can certainly use it.) When you use a stone bowl, you can make the bottom of the rice crispy. That’s called Dolsot Bibimbap. A lot of people love this type of Bibimbap. Só would I prepare the whole procedure in the bowl instead of the wok on the stove top? I love it in the bowl with the crispy rice on the bottom. Hi Hana, You prepare all meat and vegetable ingredients as shown above (in a skillet / wok). Only the assembly needs to be done in a stone bowl to make the rice crispy. Enjoy! I just finished making it and it was delicious. Too delicious since I ate half of it myself…But it tasted almost as good as it would have tasted at the nearest Korean restaurant and I couldn’t stop eating. I’ve made this many times and my husband and I just love it! He is vegetarian, so I’ve always made it without the meat, but we don’t miss it. Also, I have substituted cauli-rice and found it to be really good, too. Thanks for sharing your delicious recipe. That sauce is just sooooooo good! In the video and the full recipe at the bottom it says to add gochujang sauce. Do you really have to add that if you don’t like spicy food? If I were to reduce or omit gochujang, I might add some soy sauce to give some flavour. Just my thought. Thank you for replying! I will definitely try the soy sauce! I am slowly trying to work up to being able to handle heat, so I will absolutely try it with the gochujang in the future when I AM able to handle the spice. I came across your website looking for a simple bibimbap recipe and it got me hooked!!! So delicious!!! I have made it several times, my husband loves it (especially the great sauce) and the kids like it (without the sauce though, which they reckon is too hot). It tastes much better when I make it than when we have it in a restaurant (ok, Munich, Germany, may not be THE best place for Korean restaurants). Right now I have your honey/soy/drumsticks in the oven and spare ribs are marinating in the fridge for sunday. I can’t wait! Tried this tonight and it was amazing! Thanks so much for sharing! Hi the spinach and beansprouts are rinsed in cold water before adding the seasoning, does it need reheating before assembling the dish?? Hmm. I disagree. This was my first time making it, and the timing turned out to be more important than I thought – my meal ended up being sort of luke-warm. I think in a restaurant setting where this is normally served in a hot stone bowl, the temperature of the elements might not matter as much, but for a home dish, I think each element might need to be reheated briefly to make the whole dish nice and warm. That said, even though my dish was a little on the cold side, it was delicious. This is a really good recipe, and not too difficult to make. I used a rib meat (flanken) instead of ground beefthough – not sure I would like it as much with ground beef. HELLO RECIPE MAKER!!! Ive got to say I made your recipe today, not and it turned out better than any reasturaunt ive ever been to. I may have added a larger variety though; beansprounts, chicken, carrots, spinach, cucumber, zucchini, and shitake muchrooms. But I have to say, im in a food coma XD, and all I can think about is how great the bibimbap sauce was, I did add a little xtra sugar and sesame oil and black toasted sesame seeds, but still, the best ive ever had! Thank you for sharing, this is a must make for anyone who enjoys cooking! Great!! Glad to hear you enjoyed it so much! ? I made this today!!! Yum! the best i ever had. I’ve always liked bibimbap but was too lazy/intimidated to make it myself, I always order it whenever I go to a Korean place but it’s never as tasty as this one. Thank you, thank you for sharing. It’s a keeper. So happy to hear that! 🙂 Thanks for your feedback! I love your bibimbap and your recipe is fabulous. I always add zucchini to my vegetables and it is great. Thanks Jennifer! I sometimes add sauteed zucchini as well. It goes well in Bibimbap! Wow! This was fantastic. Thank you for the recipe. I will be looking at your website for future Korean recipes. We made this Saturday night. It is the best Asian dish I have ever made and possibly ever eaten. We are making it again tonight trying some vegetable deviations. We are also going to make some of the bibimbap sauce to try on other things (chicken nuggets). For your chicken nuggets, check out my Korean style popcorn chicken recipe (https://mykoreankitchen.com/korean-style-popcorn-chicken/). It’s also very popular among my readers. Enjoy! Hi Illiana, I used a regular soy sauce. http://amzn.to/29PFtKY 🙂 Enjoy! IF the seasonaed spinach, bean sprout and bibimbap sauce can’t finish, can we keep in refrigerator? How long?? Yes, you can keep all of them in the fridge. The sauce can be kept for a few weeks to few months if you store it well. Wow, so happy to have found your site. I’m of mix decent, and finally getting in touch with my watered down Korean blood (lol). Wanted so much to find simple recipes. At first I was a little intimidated by the pictures. They are so beautiful, I thought “oh, man another hard recipe to follow. “. So happy I ignored that part. Your recipes are simple, easy to follow, and so YUMMY. Thank you so much! Hi Ren, You’re very humorous! I’m very glad that you decided to follow through. Good looking photos don’t mean that they are going to be difficult! 🙂 I’m happy to hear you enjoyed my recipe! Thanks so much. Such a great recipe. This is my 413th time making it and with all the ingredients in the house and the Bibimbap sauce already in the fridge I find it No more difficult than many western favorites we have made it twice on weeknights with relative ease. We just returned from 10 days in Seoul and find that we crave the food even more now that we are home. It is so satisfying and delicious. And the gochugang if bought in the international market in Milwaukee is the exact same as I say in Seoul. Just with American rther than Korean writing. So happy to hear that! I checked out some bibimbap photos you shared on Instagram too! You presented them so well. Thanks! 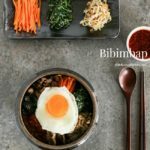 Is using raw egg in Bibimbap tradtional or always slightly fried? I want to say Thank you for sharing your great recipe. I made a few and it was easy and yummy!. My friends and I enjoyed it very much. Great recipe! I like how much detail you provide in laying out what you need to do. Bibimbap isn’t easy to make, but it’s certainly worth it when it all comes together. Thanks again for helping to make this possible! Thanks, Rob! It’s definitely worth the effort! Happy to hear you enjoyed it! Hi! Just finished eating this with my family and it was delicious! Its a lot of prep, but I agree – with enough practice it will all become easier. I have always loved eating this at restaurants and I have to say I no longer need to go out and get it. Hit the spot! The kids had their preferences about the greens and eggs but the beauty of this dish is the versatility. Only part missing for me was the crispiness of the rice from the stone bowl, next time I will try assembling in a hot cast iron dish. Thank you so much for sharing, and for the clear thorough instructions. So happy to hear that your family enjoyed my Bibimbap recipe! Yes, this recipe wasn’t written with crispy rice in mind. I’ll update this post with the ‘how-to’ next time! Stay tuned! I just made this today, I wanted to try it for so long after tasting gochujang paste for the first time. It’s a lot of work with all the different parts to it but wow it’s so good! Thank you for sharing this recipe! Really really love this recipe. This is my #1 website every time I’m craving for Korean food. Thanks Sylvie!! So happy to hear that! ? Great recipe, made it 2 times, it’s absolutely delicious. Made this tonight – waited until we could find the gochujang to do it and it was worth the wait! Not only was the dish amazing but now I want to put the sauce on pretty much everything. *lol* Thanks for an awesome recipe! Glad to hear you enjoyed it! I know this sauce is pretty addictive! ? Do you think green bell peppers would go well? I currently am short on veggies, but have nappa cabbage and green bell peppers. I also have green chillies but I think they would change the flavor of the dish too much. If green bell pepper is cooked, you can try that. You could also try sautéed nappa cabbage as well. Just made this tonight and it was amazing. I used sliced ribeye beef and quinoa instead with the addition of cucumbers seasoned similar to the bean sprouts. Honestly it came out better than I get at restaurants (because they always overcook the egg). So glad I was able to get Gochujang at the grocery! Hello! Do you have any recommendations for a substitute for the gochujang? I see that I can purchase it on Amazon, but I was hoping to make your recipe tonight! Unfortunately there’s no substitutes for Gochujang. It’s a very unique & essential Korean sauce. 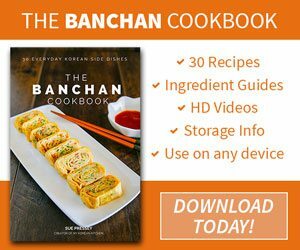 (If you love Korean food, it’s a must have pantry item.) However, I do know a few people tried this Bibimbap recipe with sriracha sauce, so you can try it that way. Though, I personally never tried sriracha sauce yet so I don’t know what to expect. Wow – I had a craving for bibimbap and found your recipe/site. Made it tonight – husband and 7 yr old son loved it! I skipped the sauce and used sriracha instead for convenience. And, I used beef strips instead of minced beef – but next time will try it with the minced beef. I loved the presentation! But, to make clean-up a little easier, I will probably mix the vegetables together in one bowl as they are ready. Hope that doesn’t offend! I added some broccoli to the mix as well to get a few more green veggies into the bowl. Can’t wait for the leftovers tomorrow! Thanks! 안녕하세요! Thank you for this recipe. I lived in Korea for a year while I was in the military and fell in love with the food and culture. I plan on going back soon to teach English with my girlfriend. 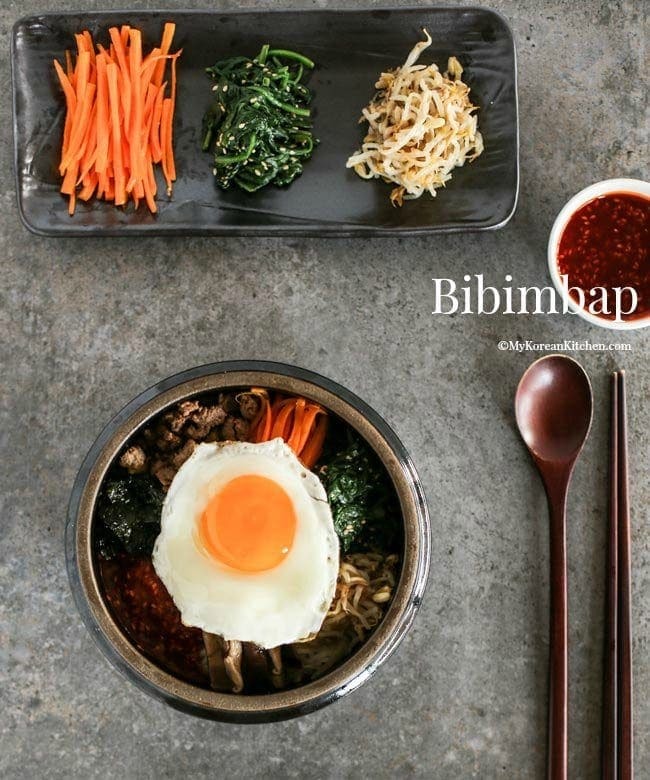 I want to introduce her to the food and culture so it isn’t that much of a culture shock and this is probably one of the best recipes I’ve seen for bibimbap so far to introduce anyone to the food. 고맙습니다! So happy to hear that, Carl! Thanks for the feedback. 🙂 I hope your girlfriend enjoys Korea too! I’ve only eaten bibimbap two times and it was always at the same restaurant. They use bottled sriracha sauce and it still tastes good. I’m wondering if that would be okay in this case, since I’m not sure where I would be able to get gochujang around my area. Personally I’ve never tried sriracha sauce so I don’t know how it will play with my recipe. But if you already had a good experience with it at a restaurant, you should give it a go. 😉 If you live in the US, you can buy Gochujang from Amazon. http://amzn.to/1SCBJfs Enjoy! Love it!!! I made it tonight and thoroughly enjoyed it. Awesome! If i had that black clay bowl i would heat it up on the fire with everything in it to attain that roasted rice texture that i dearly enjoy! Usually after we have gyros there are extra gyros strips in the pack, not enough for a round of sandwiches, but enough to use as the meat for a family meal of bibimbap! I also like to use fresh seaweed when it’s in the market. I had this at a Korean diner locally served in a hot pot so the rice got crunchy and crispy as I stirred it up, really added a nice texture. Tried this recipe tonight, and it was definitely delicious! I left out the mushrooms and used liquid aminos instead of soy sauce (not for health reasons, its just what was in the pantry) and I had to use honey instead of sugar (surprisingly, I don’t have sugar in my house) and ground turkey instead of beef. Bibimbap at my favorite restaurant is $20. Now, I can make it at home at a much cheaper price. Nice nice! I just want say thanks! Hey Sue – These photos look beautiful! And Congrats on your video recipes! I know it’s a lot of work for you. I made this tonight. I haven’t had Bibimbap in years and it is one of my all time favorite foods. I followed your directions carefully but I must admit that I doubled the meat. I used 7 ounces flatiron steak. I once took a Chinese cooking class years back, and it cooked in the wok beautifully but much quicker than 6-7 minutes. It took more than 1 small carrot to equal to 4 ounces of carrots. I ended up using 3 medium carrots but it was all fine. I wasn’t sure what “Korean Seaweed” is exactly so I just used Sushi seaweed cut thin. I cut it into strips but it was so tough I worried for my newly polished edged chef knife. It was dry and crackly so I was so unsure about adding it to my beautiful dish so I ran it under hot water and just tossed it in the pan. It was fine. I didn’t know how much to use – I think used a little more than half a package. The dish was a lot of work because I didn’t have the leftover veggies in the fridge but it was totally worth it. My husband loves Korean food and he was blown away. Thank you so much. I was thrilled with the outcome of this dish. Do you do just add the dried seaweed to the pot at the end? Does it need anything done to it first? I can’t thank you enough for this recipe. I wanted to ask if you make those Korean pancakes with vegetables and scallions in them? A friend of mine is Korean and her mother used to make them and she would bring them to me. They were delicious beyond belief. My friend told me that they were a lot of work though. I am going to rate the recipe again because I am not sure if I leave it blank if it will be taken away from the stars this recipe deserves. Again many many thanks! I can’t believe that I can now make Bibimbap at home. Here are two of my pancake recipes that contain green onions. https://mykoreankitchen.com/korean-seafood-and-green-onion-pancakes-haemul-pajeon/ and https://mykoreankitchen.com/squid-pancakes-ojingeo-buchimgae-in-korean/ The cooking technique is slightly different to each other but it is explained in the first link. Enjoy! I don’t know how the recipe rating system works, but more stars are always good in my mind. 🙂 Thanks! hello, It is me again and I am attempting this dish again after not making it for a year or so. We have been sick and I think the spicy food will make us feel better. I ordered the Gochujang and this time the right kind of dried seaweed- Korean seaweed. I have been fixing one of the vegetables per a day for the past few days and I have all the vegetables made. I just have to make the meat, rice and eggs tomorrow. I am forever grateful for your help. It is absolutely the best thing that I can make Bibimbap myself. Do you have any suggestions on preparing the rice itself? Do you have a rice cooker? That’s the quickest and easiest way to prepare rice obviously. 🙂 You can also use this information too. 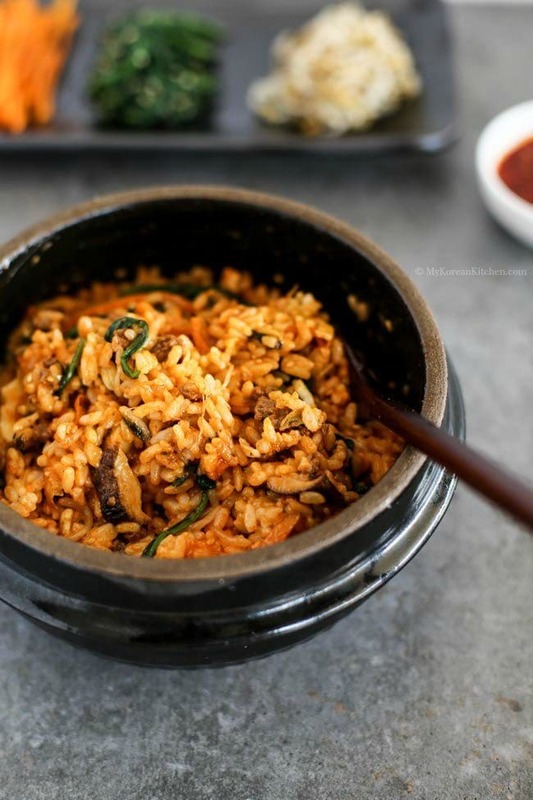 https://mykoreankitchen.com/how-to-make-perfect-korean-steamed-rice-step-3-how-to-soak-and-cook-the-rice/ If you want to make crispy Bibimbap, refer some techniques from this recipe. 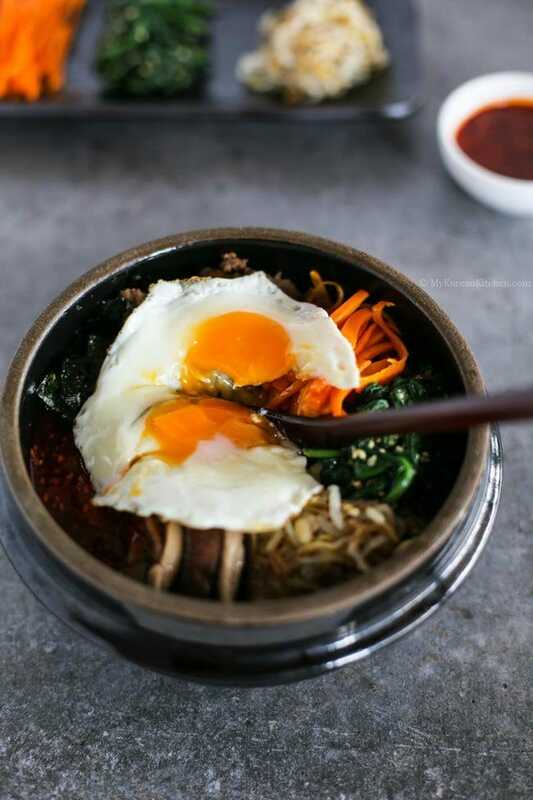 https://mykoreankitchen.com/dolsot-bibimbap/ Hope these help! This is a fantastic recipe and even saves well as leftovers! (I store the various components separately.) I’ve made it twice- the first time following the directions very closely, the second I made a few changes mostly to cut down on time and the number of dishes required. 1. I sauté the carrots for about 2 mins, then add in thinly sliced zucchini and sauté for another couple of mins, and finally add in the mushrooms for a final 2 mins. I find this cooks the carrots a bit better. Since all the veggies end up mixed up in the bowl, it really doesn’t make much of a difference (slightly less pretty presentation) and makes storing the leftovers easier. 2. Similarly, I mix the sprouts and spinach together with the sesame oil/garlic dressing. I start by boiling the sprouts and use a slotted spoon to remove them to a medium sized bowl. This allows me to save the already boiling water for the spinach. I drain the spinach (squeezing out the extra water) and add it to the spouts bowl to mix with the dressing. 3. I was running short on time so I substituted Sriracha rather than make the Bibimbap sauce. I love how simple this recipe is, even if it requires lots of chopping and dishes 🙂 Super easy to add your own twist too! So i’m also tackling recipes but my question is do you have to add the mushroom? Lol i just don’t like them so i was wondering if they neef to be there or not ^^ thank you!! One of our absolute favorite Korean dishes. Yours looks so so good! I never thought it could be cooked as easy as this, all thanks to how you demonstrated it in very fine details. Simple and yet very delicious. Looking forward to seeing more awesome recipes from you. Keep it up Sue and more power to you! I made this for my sister and her boyfriend today and it turned out very good! I’m sure it could’ve been much better but as this is my first time ever making steamed rice and this kind of food, my 16 year old self is very proud! I’ll definitely be making this often and recommending it to my friends!! I’m so glad I found this recipe, thank you very much! I’m on mobile and I accidentally pressed four instead of five stars. I’d rate this with 100 stars if I could! Thanks Sophia! 🙂 I’m happy to hear you enjoyed it. You should definitely be proud of yourself! I’m going over to friend’s place to eat bibimbap. I’ve been told bring some veges which don’t need to be cooked which will be mixed into the dish. Can you please recommend any vegie which don’t require cooking but can be chopped and eat straight away. Hi Jacob, how about taking some seasoned Korean seaweed? I know they are not veggies, but it’s very practical. If you buy pre-cut seaweed, all you need to do is opening the packet. Besides, it goes very well with Bibimbap! I just made this dish tonight and the husband was amazed that it was home made! Thank you very much for the great recipe and the delicious looking photos! Hi Cyndi, So happy to hear that! 🙂 Thanks for trying out my recipe. Oh Sue! Thank you so much, I just made the best bibimbap ever and I owe it all to you. 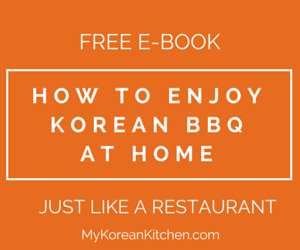 No Korean Gramma’s, no fairies or elves, no magic, just me, my kitchen and your recipe. Amazing! I’m so happy. Thank you! :)) Thanks, Danny! I’m as excited as you are! I’m very happy to hear your success! We make this often at our house and call it “Korean Eggs”. We always have kimchi and gochujang in the fridge, and we keep chickens, so we usually have organic eggs on hand too. I saute some mushrooms and spinach and add some veggie leftovers from previous meals. So easy and delicious! (Very frugal too!) Can’t wait to try your version! Hi Kim, why do you call it Korean eggs? 🙂 Just curious. Anyway, I hope you like my version. This has been the most popular recipe on my blog since 2013. I hope you like it. Enjoy! I just made this for supper and it was amazing 🙂 I used brown rice because thats what I had and it still tasted great. Thanks Stephanie! Glad to hear you enjoyed it with your brown rice! Hello. Can you provide any information on the type of rice needed to get the exact texture and taste that you find in Korea? Is the type of rice usually sold for sushi suitable? Unfortunately, here in Italy we have so many local kinds of rice that it’s difficult to find foreign ones, except basmati and jasmine! Thanks! I bet it was extra yummy with Wagyu! I love it. Glad you liked my recipe! Thank you for this easy-to-follow recipe. Made it tonight and it was absolutely fabulous. Thanks Sonja for trying my recipe! I’m glad to hear you enjoyed it! Hi Sue! I was so excited when I came back here in DC from a holiday . I’ve tasted bibimbap on the plane ( Korean Air) and really really like it. As soon as I arrived home even with a jet lag I googled this bibimbap. Now I know how to make it!!! So delicious!! Thanks Sue for sharing it!!! I even told my friends about this. Thanks Molly! Korean Air Bibimbap is pretty good. I always eat their bibimbap over any other food on their menu. It’s easy on stomach as well. 🙂 Anyway, I hope you enjoy my recipe. Thank you also for sharing about my blog! Hi Sue! I just wanted to let you know that I ALWAYS come back to this page that you’ve created when I want the house to smell soooooo amazing! You have the best sauce for Bibimbap evah! 🙂 Thank you!! Awesome!!! Thank you for your kind word! I just came back from a five month australia trip and googled for one of my favourite food court meals – bibimbap. Thank you for your great recipe! 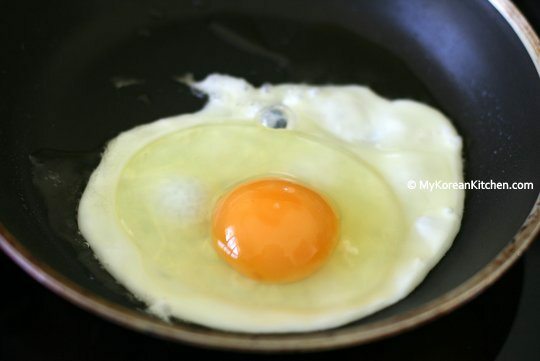 Just one just, are you mixing the egg with the other ingredients? Just asking because that isnt very common for me. That’s interesting. I think most Koreans do mix all ingredients at the same time. Japanese on the other hand, they don’t even like mixing them at all. I heard that they think bibimbap present so nicely that they don’t want to ruin its beauty by mixing them. So they eat individual ingredients separately with their chopsticks. At least that’s what I heard a long time ago. I don’t know how true that is though. It’s always interesting to learn how different cultures do different things. 🙂 Hope you enjoy it! We made this recipe tonight, it was great! One question…. how do we get the stone pots hot enough, and what temp. do they need to get to , in order to make the rice crispy on the bottom? Hi Amada, Glad to hear you enjoyed it. Hmmm, I don’t normally eat Bibimbap in a hot stone, so I can’t answer you yet. I’ll do some experiment and will update the post. Though based on my brief research people typically heat the stone for about 10 mins on high heat (you’re supposed to hear rice crackling noise) and then leave another 5 mins on low heat to make the bottom rice gets crispier. Are you using raw stone pot? or ceramic stone pot? I think that will make the cooking time different as well. Hope this helps! Hi! I made this the other night. My daughter works at a restaurant where the chef’s are Korean and they make her BimBimBap when she works a shift. She loves the dish so I decided to try my hand at it (I’ve tried it at restaurants and haven’t been impressed). I tried your recipe and it was delicious!!! Both my daughter and I loved it! I did just use ground beef (all we had) and I made the spinach and bean sprouts as you suggested. Excellent!!! Thank you! Before I came upon your website, I saw another recipe where they fried the rice in a cast iron or nonstick skillet to get the crispy bottom. Would this take away from the flavor of using the stone bowl? I will definitely be trying this recipe, thanks for sharing! Bibimbap is the best food for cold weather. I have just had my first ever bowl of bibimbap and it had me at the first spoonful. I’m not a fan of spicy food, but since I’m in love, bibimbap is the only exception. Thanks a lot for posting this recipe. Have a good day! I’m so glad that I found your website. This Saturday will be my very first time ever trying to make this dish. Love bimbibap, but there is one thing i want to ask you about making warm bimbibap. I like it when the rice is crispy. Like when you serve it on a hot stone the rice will become crispy. Can you still do it with this recipe? Hi I really liked your recipe! Especially the side dishes recipes. I tried experimenting with other vegetables like french beans, kai lan and it is all good (yes vegans out there, you can try an all vegetarian bibimbap)! Simple and nice! Next the sauce is to die for, simple clean and tasty! Last time I use to follow another recipe and the sauce was complicated. After a few mouthful and I will get sick of the bibimbap but with your sauce, I can even do seconds! Simply amazing! For my eggs, I poached it instead. Hi Sue, it’s me again. Thanks for your recipe, I loved it. I bought a raw stone bowl, but not sure how to maintain, it would be great if I can get any tips from you? 1. In a large pot, submerge the stone bowl in water with a spoonful of salt and boil for 20 minutes. 2. Carefully remove hot stone bowl on a heat proof surface and paint edible oil all over the stone bowl (bottom, inside, rim, outside) until the oil no longer permeates the stone. Hi Steve, Thank you so much for the tips. It seems to be difficult to do this, maybe I should change to a ceramic stone not the raw stone, might be easy to handle it? What do you think? Hi Nancy. Yes, but I only had to do this once. If you like crispy rice at the bottom use the Korean Stone Bowl (Dolsot). I think you will like it. If you just want to use a bowl and lightly heat it, I would use the Korean Dolsot Ddubaegi (Earthenware) Stone Bowl. I like the Dolsot as it keeps the food warm for a long time. Once you seasoned the stone bowl, maintenance is very easy. Once the bowl gets cold, use warm water, non abrasive soup, and a sponge. In my family we use the large sized Dolsot and when I make it everyone wants the crispy rice at the bottom. I fell in love with this recipe after making it once. Turned out very delicious and will make it more often. One negative comment. In making this recipe, I found it annoying having to go to another page to obtain the recipe(s) for the spinach and bean sprout. For the future, can you please keep the recipe confined to one page only? Great to hear you liked the recipe. 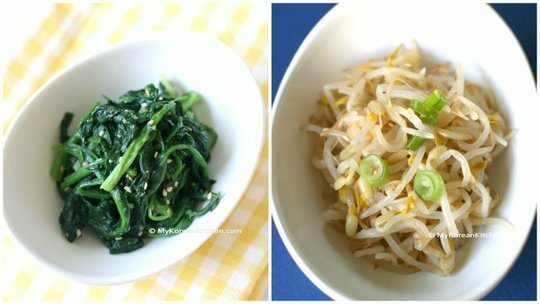 The reason for having separate recipes for spinach and bean sprouts in a different page is that they can be served as a side dish, independently from Bibimbap. If I included it all in one recipe, people won’t be able to search for it unless I made a duplicate recipe. I hope you understand. I love your recipe! And I will definitely use this next week but I have a friend who cannot eat spicy food, so I wanted to ask you if there is a milder version of your sauce. Thanks MD, hmmm unfortunately I don’t have mild version of sauce. Perhaps you can reduce the gochujang from this recipe. (Though, I don’t think this sauce was spicy…) Maybe you can try this sauce first then alter a bit? It’s always good to test the recipe before hosting a party. 😉 Let me know how you go! I tried your recipe and the sauce is too hot for my friend. So instead of gochujang I used tomato paste. The taste is not bad but I like yours more. Thanks again! Hi MD, Sorry to hear that the sauce is too spicy for your friend. Adding the tomato paste didn’t even cross my mind though. I didn’t think the taste would be good with it. 🙂 Anyway, glad to hear you liked my sauce! I made this meal as a surprise for the wife and it was total perfection. We both eat chicken Bi Bin bap regularly but never dreamed of cooking it at home. This will be a weekly home meal from now on. Thank you very much indeed, we will enjoy this for a lifetime! Thanks Stewart! That’s such a compliment. 🙂 I’m so happy to hear that both you and your wife enjoyed it so much! Just tried this recipe tonight. Huge success! Super yummy and super easy!! Hello sue. I do interested to try korean cuisine. And i would like to ask you, is it chilli powder same with pepper flakes? I afraid they might be different result of taste. So hard to found pepper flakes in my place. I had made kimchi but i used chilli powder. I wonder chilli powder could ruins my kimchi taste? Hi Elina, people who cook Korean food uses the term red pepper flakes and red chili powder interchangeably. Korean chili powder/pepper flakes tastes different to the indian/thai/mexican kinds of chili powder. So if you used just any chili powder for your Kimchi other than the Korean kinds, it won’t taste like authentic Kimchi and yes, it can ruin the Kimchi taste if you use the wrong kinds. 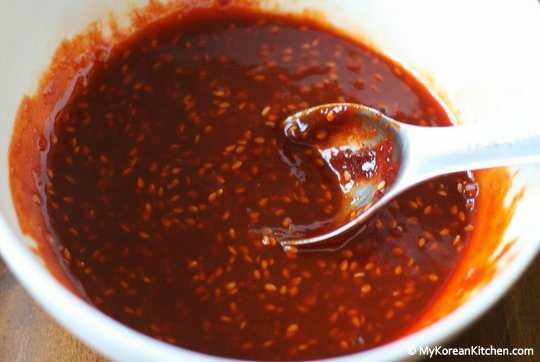 I have written about Korean chili powder in this post ( https://mykoreankitchen.com/2006/12/15/chili-powder-gochutgaru-in-korean/) a long time ago. While it’s not very comprehensive, you can get some basic idea about it. Hi Blair, unfortunately I haven’t come across the sauce you’re describing for Bibimbap. I’m very curious to find out though! Humm I will let you know once I see anything like it! I’ve been wanting to make bibimbap at home for a while now, but wasn’t sure I could do it justice. This is so beautiful! I cannot wait to try it! Thanks Caroline! I hope you get to try my Bibimbap recipe! It’s not too hard. It just needs some coordination skills. 🙂 Thanks for stopping by! Yum, I’ve been eating this all week. Looks so delicious and surprisingly quite simple! I’ve really wanted to make bibimbap at home for a while, and this looks fairly easy to follow! I love the Korean metal spoon/chopsticks. Any idea where I can get them? If you are in the U.S. try your local H-Mart. I am lucky enough to have one close by in Chicago. Also a good source of ingredients! I’ve been trying to replicate a chili sauce I was served over bibimbap at a Korean restaurant, and your recipe is even better!! It will be my go-to recipe from now on–makes all the difference to bring out the flavor of a bowl of bibimbap. Great! I’m very pleased to hear that you liked the sauce so much!! Enjoy! YES! This is my most favorite Korean dish (well, I have too many that is tie, so I should say one of my most favorites). I always order it when I go to Korean restaurant. I really want to buy the stone bowl too… 🙂 I can’t wait to try your recipe! I have been wanting to give bibimbap a try and now thanks to you I can. The recipe sounds scrumptious! I’ve never had bibimbap before and I really want to! Looks so good. You should definitely try this! It’s very healthy and of course, delicious! Really!? I can’t believe you’ve never had this before. You cook so many other Korean dishes though. 🙂 You should give it a try! Since you can eat Kimchi, you can handle this well too. I love bibimbap and yours look so delicious, Sue! Yummy pictures, too! I absolutely love this recipe. I have it once a week. It’s very hot here, so last night, I had it on romaine, spinach and napa cabbage (sacrilege, I know) and it was so delicious. Thanks Susan, I’m so happy to hear you love my recipe! Enjoy!